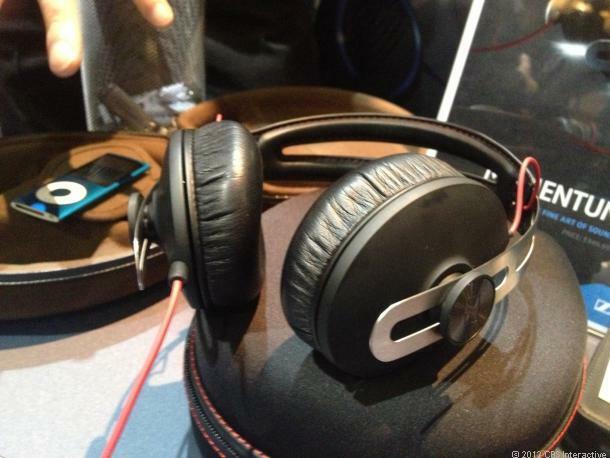 It's still early in the show, but one of the nicer pair of headphones I've run into is the Sennheiser Momentum, which is available in brown or black for $350. What makes them so nice? Well, for starters they're very light. They're also very comfortable, with real leather memory-foam earpads. I only got a chance to wear them for about 5 minutes, but Sennheiser reps said they're designed to be worn for hours and I believe them. My spot impression as far as their sound goes is that they have a warm, natural sound, that's very detailed. These are not bass-heavy headphones; rather they have a balanced, audiophile sound profile. I also liked that the plug had a hinge in it, so you can go with a straight plug or a right-angle plug. More headphones should offer this feature. Other extras include an Apple-friendly inline remote with microphone. Sennheiser present the Momentum as new-for-CES product, but it's been shipping for a few months. I look forward to giving them a longer listen to see how they stack up to other higher-end headphones back at the office. Do leave your precious comments.